After our shake-down cruise and commissioning at New Orleans we were ready for orders to take us to a war zone but first we had some serious modifications made at the Naval Shipyard. We had four more davits installed to bring our LCVPs up to a total of six. The three inch gun which was mounted in a gun tub on our stern was removed and a twin 40mm Bofors installed in it's place. We had engaged in gunnery practice with the three incher and almost hit our target. We were surprised and disappointed to lose it. The theory was that we would be more likely to be subjected to attacks from the air than from surface vessels. The biggest surprise came when the yard installed large timbers on our main deck, greased them and then using a very large crane, lifted an LCT on top of them. This completed, we had the crew come aboard for transport to our still undisclosed destination. We then went to Baton Rouge and took on 180,000 gallons of fuel which was stored in our bottom compartments. When we left the Gulf of Mexico and headed north we finally knew that we were assigned to the European theater. Being the skipper of an LCT is not a great assignment. Being the only officer aboard you do not have the companionship of a peer. If you do your job and enforce discipline the men resent you but if you are lax the men will not respect you and may ignore your orders. The crew we took on board were undisciplined and lax in performing their duties. The skipper seemed indifferent to the situation. His wife had joined him in New Orleans and he went ashore every night to join her. Some of us warned him that unless he got control of his crew, he would have a difficult time after his LCT was launched. This advice was completely ignored. 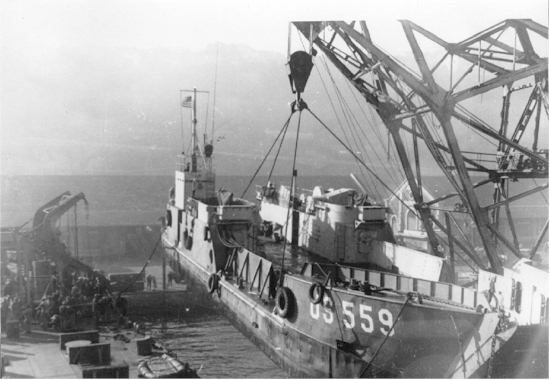 The crew was assigned certain watches and duties on our LST which were performed reasonably well. However while our crew was engaged in drills and maintenance, the LCT crew would go aboard their craft and sack out. We reached New York for a short stay for taking on supplies. The LCT's skipper's wife again joined him and we saw very little of him. After a short stop at Quonset, Rhode Island we sailed to Boston. This was to be our last port within the States. The LCT's skipper went to the Naval Hospital and it was revealed that he had a hernia. He was then discharged from his duties with the LCT and admitted for surgery. His replacement arrived just a day or two before our departure. He was probably about 21 years of age. He had been first in the 90 day wonder program to become an ensign and then had about a three months course in the operation of amphibious craft. He was a very nice, sociable young man but not nearly tough enough to take on his spoiled crew. We tried to help him while he was on board but there was only so much we could do. Crossing the North Atlantic in winter time with a slow convoy is an experience which was covered in another episode. Eventually we did reach Falmouth, England and pumped our fuel oil cargo into storage tanks. Within a few days the Germans bombed the fuel oil storage tanks and set them on fire and the cargo which we had brought all the way from Baton Rouge went up in smoke. This was not a good omen! We then went to Plymouth to launch the LCT 559. Our instructions were to shift our liquid storage to the port side to develop a 13 degree list. We crafted a makeshift list indicator and started pumping. I had all the ballast tanks on the port side flooded and the starboard side empty but still could not get the 13 degrees. We then shifted fuel and fresh water and came up with about 11 degrees of list. The only thing remaining was to pump fresh water overboard which we thought was too precious to waste. After discussing the situation, the Captain approved launching with the list we had. My input was that I was sure the launch would be OK. All the blocks were removed and the trigger, consisting of a steel cable, was cut with a fire axe. The LCT dropped in the water and after rocking back and forth a few times came to rest about six feet away. We had a little ceremony on board and said farewell. Later we had several visits from the new skipper of the LCT and we knew he was having a rough time of it. Finally on his last visit his morale had climbed way up because the Navy had assigned a second officer to the LCT as his executive officer. We never saw him again. We learned that the LCT 559 had sunk on D-day while making it's first run to the beach. This probably was at Omaha beach. All officers and the crew were lost.